by Brianna Crandall — June 13, 2018 — The winners of the 2018 Best of NeoCon Competition were announced on June 11, during an awards breakfast hosted by Contract magazine on the first day of the NeoCon contract furnishings show, held this week at the Merchandise Mart in Chicago. A total of 81 awards in 39 categories were distributed in this year’s competition. 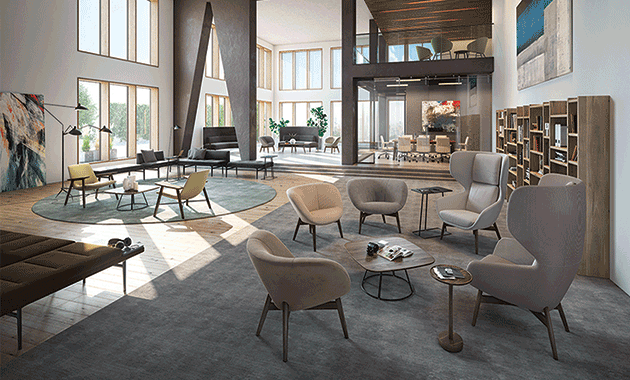 Untucked by Keilhauer won Best of Competition, along with a Gold award in the Lounge Furniture Collections category and a Silver in the Furniture Collections for Collaboration category. Look for more details about Untucked in a future FMLink article, as well as articles showcasing other products exhibited during NeoCon 2018 that may be of interest to facilities managers. Untucked by Keilhauer won Best of Competition, along with a Gold award in the Lounge Furniture Collections category and a Silver in the Furniture Collections for Collaboration category. Image courtesy Keilhauer. Celebrating its 50th year, NeoCon is a premier exposition and conference for commercial interiors, and is annually attended by over 50,000 architecture, design and facilities management (FM) professionals and specifiers from around the world. With nearly 1 million square feet of exhibition space showcasing 500 leading companies, the show launches thousands of new products and covers a spectrum of vertical markets including workplace, healthcare, hospitality, retail, education, public spaces and government. Celebrating its 29th year, the prestigious Best of NeoCon Competition honors new commercial interiors products that are introduced to the market during that year’s NeoCon (introduced to the market since the previous edition of NeoCon) in 41 categories ranging from Acoustic Panels & Solutions to Workplace Technologies. Best of NeoCon jurors — architects, interior designers and FM executives responsible for selecting and buying furniture and furnishings for their organizations or clients — reviewed 375 entries in 41 product categories digitally and in person immediately prior to the opening of the show. The Best of NeoCon Competition is sponsored by Contract magazine and co-sponsored by NeoCon, the International Interior Design Association (IIDA), the International Facility Management Association (IFMA), and The McMorrow Reports for Facilities Design & Management. The jurors selected Gold and Silver winners in each category, as well as Innovation Awards and a Best of Competition winner. Contract editors also selected winners for the Editors’ Choice awards. Product descriptions and photos of the Best of NeoCon entries in all 41 categories are viewable on the Contract Network site. Winners will be showcased in the July/August issue of Contract. For more information on Teknion’s FM-related products, see the company’s FMLink ad. Luminaire Level Lighting Controls help office building achieve significant energy savings and integrate building systems May 26, 2018 In "Case Studies » BetterBricks"